What's the carbon footprint of an email? PARIS: A long list of seemingly harmless everyday actions contribute to emissions of carbon dioxide (CO2) and other climate-altering greenhouse gases. Driving a car and flipping a light switch have a clear "carbon footprint" -- much less obvious is the harm caused by sending a simple text message or opening a bottle of water. To put this into perspective, the carbon output of hitting "send" on 65 mails is on par with driving an average-sized car a kilometre (0.6 of a mile). The culprits are greenhouse gases produced in running the computer, server and routers but also those emitted when the equipment was manufactured. It gets worse when you send an email with a large attachment, which puts about 50 gCO2e into the air. Five such messages are like burning about 120 grammes (0.27 pounds) of coal. 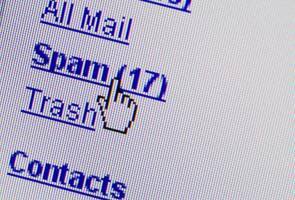 Receiving a spam message -- even if you do not open it -- has an environmental impact of 0.3 gCO2e. Here is something to keep in mind the next time you type in a non-essential Google enquiry: A web search on an energy-efficient laptop leaves a footprint of 0.2 gCO2e. On an old desktop computer, it is 4.5 gCO2e. And that text message? It comes at a cost of about 0.014 gCO2e. Plastic grocery bags each have a carbon footprint of 10 gCO2e, but the paper ones are even worse at 40 gCO2e each. Store-bought bottled water has nearly 1,150 times the emissions attached to it than a glass poured from the tap. A 500-millilitre (one-pint) bottle is responsible for 160 gCO2e compared to 0.14 gCO2e for tap water. A large cappuccino comes with a footprint of 235 gCO2e, partly because of the emissions from raising the cow which produced the milk. For a cup of home-made black tea or coffee for which just enough water was boiled, the figure is 21 gCO2e. The bigger the TV, the bigger the cost in greenhouse-gas emissions. Watching two hours of tube on a 24-inch (61-centimetre) plasma screen pumps out 440 gCO2e -- about the same as driving a car for 1.6 km. The footprint is 68 gCO2e and 176 gCO2e respectively for two hours watched on a 15- or a 32-inch LCD screen. A mile of cycling fuelled by a meal of bananas would be responsible for 65 gCO2e, compared to 260 gCO2e for a mile powered by cheeseburgers. Let's Talk: Leisure - How Are We Spending Our Time?